Last month's review of the BenQ W5000 made it clear that BenQ was back in the home theater projector game in a big way. This month, we take a look at the BenQ W20000, a DLP 1080p powerhouse with spectacular contrast and true to life color. The W20000 has a bright, vibrant picture coupled with sharp details and inky black levels. It is currently selling for $4,999. Extremely sharp picture. The BenQ W20000 has the sort of razor-sharp clarity that can make other 1080p projectors look soft in comparison. Every single detail in every single frame jumps out at the viewer in full resolution. This is especially wonderful when watching nature programming such as Discovery HD Theater, where there is always an abundance of fine detail. This extreme sharpness can, however, make the W20000 seem a bit "artificial" when compared to some other projectors, mostly when viewing film content. Excellent color. After some adjustment, the BenQ W20000 tracks very close to the ideal 6500K across the entire grayscale. Our test unit required a boost to both red gain and offset, and a decrease of two to three points to blue and green gain and offset. After this adjustment, the W20000 was nearly perfect from 30 IRE to 80 IRE, absolutely perfect at 90 IRE, and slightly too cold at 100 IRE (about 6900K). All in all, the color accuracy contributes to a vibrant, life-like picture that is true to the source material. High lumen output. In "Standard" image mode with the lamp on high and the iris open, the W20000 measured 621 ANSI lumens. Low lamp mode causes a 15% drop in lumen output to 528 lumens. "Cinema" mode measured 511 lumens in high lamp mode, and "Dynamic" mode measured 505 lumens. The W20000 also has a manual iris, which cuts lumen output by 32% when fully closed. This gives the projector an impressive range, making it adaptable to rooms with moderate ambient light or darkened theater environments. Quiet operation. 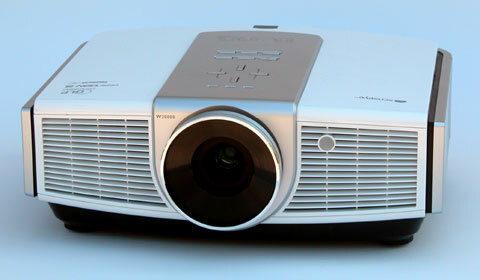 The W20000 is a large projector, weighing in at over twenty pounds. It uses a 200-watt lamp, which is lower wattage than some other DLP projectors of similar lumen output. With its large case you end up with a quiet projector. In high lamp mode, the projector is only noticeable within a five foot radius, while it is nearly silent in low lamp mode. Dual-iris system. In addition to the manual iris mentioned earlier, the W20000 also has an automatic iris. This auto iris is activated by turning on the "DynamicBlack" option in the menu system, and can lower black levels in dark scenes without compromising lumen output in brighter ones. During normal viewing of video we did not notice any unnatural dimming or brightening effects attributable to the auto iris, and adjustments were invisible to our eyes unless we were actively looking for them. Great ANSI contrast. The BenQ W20000 measured 560:1 ANSI contrast during our testing, which is the highest reading we've seen on any projector since we began testing for ANSI contrast. Full On/Off contrast with the auto iris active measured 8800:1. This does not necessarily translate into a clear, perceptible advantage over other projectors, but it has the potential to do so in a dark viewing environment. Nevertheless, the real-world contrast performance from the W20000 is excellent by any measure. Powered lens shift. Like the W5000, the W20000 has a two screen height powered vertical lens shift. This can simplify installation in both ceiling mounts and rear shelf installation. Since lens shift is rarely changed on a home theater projector after installation, the fact that it is powered is not as important as the fact that it is present at all, but it adds a nice touch of convenience. Good connectivity. The W20000 has a nicely featured connection panel, with two HDMI 1.2 inputs, YPbPr component inputs, the standard composite and s-video, RS-232C for external control, a 12v trigger for motorized screens or an anamorphic lens, and five BNC connectors. This gives you four viable inputs for high definition sources, as the BNC connectors can be used for component video or RGBHV data signals.